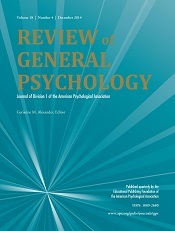 Review of General Psychology (ISSN 1089-2680) is the quarterly scientific journal of the American Psychological Association Division 1: The Society for General Psychology. Review of General Psychology publishes cross-disciplinary psychological articles that are conceptual, theoretical, and methodological in nature. Other aspects of the journal include the evaluation and integration of research literature and the providing of historical analysis. The first issue of the Review appeared in 1997. The current editor is Gerianne M. Alexander of Texas A&M University, College Station, Texas. According to the Journal Citation Reports, the journal has a 2016 impact factor of 1.492, ranking it 54th out of 128 journals in the category "Psychology, Multidisciplinary".